A great communicator’s success, to a large degree, comes from an ability to argue with manners and without causing undue fatigue or frustration to those participating. The level of persistent disagreement around public policy today is disheartening but unlikely to abate. The constant vitriol is creating problems and enormous challenges in our communities – challenges that are disruptive to business, stable government, safety and to civil order. But in all this disorder and frustration, lies opportunity. We argue with manners when we follow a few basic rules of civility. My own skills have been honed to argue with manners and respect. I have come a long way from a South Carolina railroad town to working in corporate communications in New York City at Rockefeller Center and Wall Street. I’ve had my fair share of battles with the media and other detractors who have disagreed with policies I represent or businesses who have made mistakes. Over the years I’ve learned to collaborate instead of argue. That means communicating effectively and remembering to always argue with manners. People will, in turn, respond with civility and respect in most cases. Here are three key guidelines I follow to argue with manners when finding myself in controversial debate. My tactics are similarly applied whether debating public policy among friends, family or associates, and my tactics are the same when intervening during a corporate scandal. By holding ourselves to high character standards, positive outcomes result. If you argue with compassion you’ll find yelling is not needed. First, engage someone’s different opinions with collaboration in mind. Discussion is not for changing someone’s mind. Paul Harris famously said it is always the way of Rotary to focus on matters in which members are in agreement, rather than upon matters in which they are in disagreement. Of course there will be disagreements. Acknowledge those points you disagree with and move on. Although often unrealistic, I aspire to follow the 60/40 rule in regards to listening vs. speaking. Listen 60% of the time and talk 40. Second, never communicate in anger. You’ll be perceived as compulsive and vindictive. Many of you may be familiar with the story of President Lincoln’s skewered response in a letter to General Meade, who squandered a golden opportunity to seize General Lee and essentially end the Civil War at Gettysburg. Instead, the war raged on for nearly two more years. Lincoln never sent the letter to Meade. It is thought the letter was written to relieve incredible frustration, but withheld to better appreciate the situation of Meade, to prevent unnecessary distraction, and to maintain a relationship important to the national interest. Finally, show respect and empathy toward others when in debate. Dignified treatment inspires respect. Civil debate survives on respect. Maya Angelou said that we all have enough empathy to go around, but sometimes we may not have enough courage to display it. It takes courage to show respect and compassion in heated arguments. Admitting our differences demonstrates understanding. Verbalizing someone’s frustration does not mean you agree with their solution to the problem. But it does demonstrate a greater understanding of that problem. To argue with empathy means to embrace the other’s perspective no matter how foreign it may seem. Conflicting perspectives provide an opportunity to learn and teach. 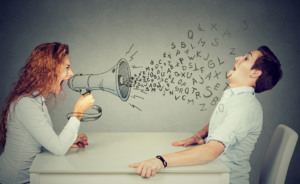 When we argue with manners during debate it demonstrates the best or worst of our characters and can dictate success in our lives while impacting the world around us. “Service Above Self” is the singular phrase you should dedicate yourself to. Diverging perspectives teach us much about those around us. Keeping it civil when discussing those differences is one of the best services we can provide. It happens to be pretty good marriage advice, too.